MOSCOW (AP) — Olympic champion Stephen Kiprotich of Uganda pulled away late in the race and won the men’s marathon gold medal Saturday at the world championships.Boston Marathon winner Lelisa Desisa of Ethiopia took the silver, 21 seconds behind Kiprotich’s winning time of 2 hours, 9 minutes, 51 seconds. Tadese Tola of Ethiopia won bronze, 32 seconds behind. No Kenyans were in the top three for the first time at the world championships since 2005. Kenyans had won the last three world titles. The top Kenyan on a sunny and warm afternoon in Moscow was Peter Some in ninth place. Congratulations Stephen Kiprotich! Love the way he hi-fives and begins his celebration before the finish line when he knows no one can catch up with him. May you be richly blessed to continue excellent races. 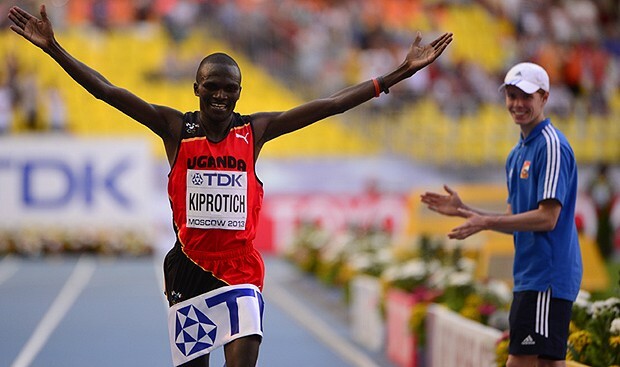 Kiprotich is an african hero,we as africans we are very proud of him,let him keep up the good work.